So, I presume there was some separation of Church and State issue at play? This was a public theatre to make a point about this? Most Christians understand this aggression. Perhaps you can help make sense of it to them. Yes, it is public and courtroom theater to make a point. First of all, The Satanic Temple is an atheist group. TST says that Satan is the most misunderstood and maligned fictional character in the Bible. TST plays a very important role in Church and State controversies. TST is similar to the Church of the Giant Spaghetti Monster (another atheist legal group). Both groups have a useful roles - TST to invoke fear and darkness, and Church of GSM to be whimsical and humorous. In this case, the Oklahoma Supreme Court has already ruled that a State sponsored Ten Commandments monument was unconstitutional and had to be removed from the capital grounds. So to circumvent the State Constitution, a single legislator got through a bill allowing any licensed Church to put religious monuments on the capitol grounds once they are approved by Capital Grounds Committee of the Legislature. Of course, this Christian legislator raised millions privately for a Judaeo-Christian Ten Commandments monument (even bigger than the previous one). 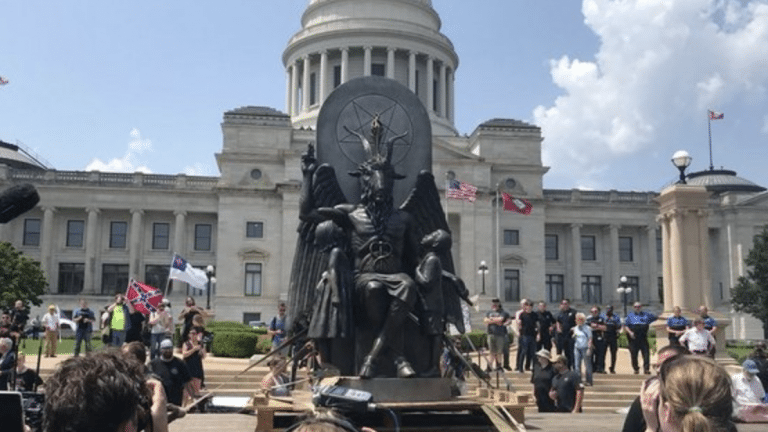 So enter Satanic Temple with their monument to be placed right next to the Ten Commandments. Big legal fight to ensue. What usually happens is that level-headed Christians and non-Christians get totally applauded at both sides and demands that ALL monuments be removed. That is what separation of church and state is all about. But in this case you have to have two monuments built and have theater like this before going back to none.